Following suite, it makes sense that Autodesk’s Revit has a large enough feature/functionality set where many options may never come into an architect/builder/user’s use. For instance, not every architect is going to want to experiment with the interior lighting conditions in order to calculate the building’s energy efficiency. In many such cases, it is obvious, that the Revit user or any software’s user will not be utilizing the complete functionality of the software. Hence, it made sense for Autodesk to create a light-weight version of almost all of their software suites and packages, identified by the “LT” suffix. I’m going to give you a breakdown of when to purchase the heavy-weight all-encompassing software package (Revit) and when to take a step back and settle with the less expensive, less detailed LT version. First, let’s talk about desktop subscriptions and licensing. One of the great things about AutoDesk’s subscriptions is the fact that most packages and suites have equal accommodations. What I mean here is, that both (Revit LT and Revit Building Design Suite, Premium suite or Ultimate suite) have free trials with pay-as-you-go access. Software updates are readily available no matter what your payment plan or payment status is and online support is available in a variety of forms. All licenses are scalable which basically mean you can add nodes (stations) and port your license over also. 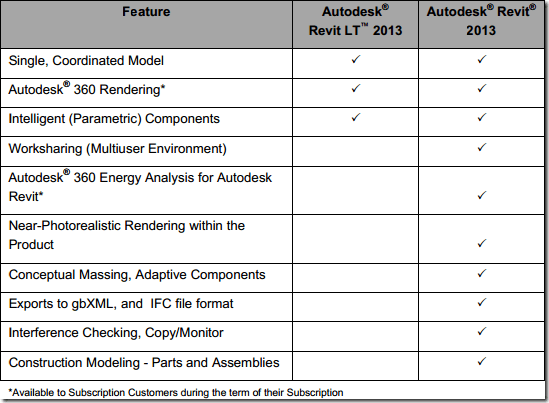 For a more detailed overview, make sure to check out the full table comparison on Autodesk's websites. Following the commonalities, let’s talk about the modeling bells and whistles. Both Revit suites/products make very well for architectural walls, curtain walls, floors, roofs, ceilings, and column feature sets. Design options for the aforementioned and loadable components are included in either of the packages just like room and area, site design features. Stair components and ramp/rail specific manipulation is available and for the 3D model rendering options, anti-alias is a mutual plus. And that’s where this handholding stops. Following construction modelling parts and assembly facility is only available in the Ultimate/premium suite and not in the LT version. Stairs cannot be created from drafts and sketches in the LT version, which is a premium-only feature. Following architecture-specific modelling, structural modelling encompasses a greater scope of construction and building (civil) engineering. Both packages include structural wall design and development, floor slab design and pre/post-production placement and foundation-specific data analysis and views. Structural columns, beams and braces are also included. Following this, slanted columns and trusses plus reinforcement-oriented planning and design are only available in the premium versions, not the light-weight version. Some other modeling functions (advance engineering concepts) are obviously non-existent in the LT version. These include mechanical features such as HVAC duct systems, central heating units, structures and setups. The premium versions allow you to design and develop virtual HVAC ducts and central heating/air-conditioning structures that you can actually simulate to test heating and cooling properties of the building. Coupled with the GreenBuild engine (another AutoDesk product), the buildings heating/cooling can be monitored and analyzed for real-time cost estimations, even before the building is conceived. The same GreenBuild engine is part of the premium package that allows power and lighting system simulations and placement with electrical component design particulars. Moreover, the premium version also supports adding piping and plumbing simulation, hence compensating for the most common and basic as well as advance mechanical, civil, electrical, plumbing engineering phenomenon all under the same hood. In addition to engineering-discipline-specific design and development, some advanced 3D modelling concepts are also available in the two types of suites. Family editor allows you to add and manipulate a family set when and however you like from the parameter manager. But all this is available in the LT version as well, what is not is conceptual massing and adaptive components. This is where the limits of power come in and the LT version is stuck with a family editor only, no alternatives available. Last but not least, the premium versions offer a range of analysis tools which are not provided in Revit LT. A360 energy analysis, area analysis, analytical modeling, structural loads and boundary conditions, structural analysis, heating and cooling load balancing, sensory estimations, massing studies, and even solar exposure for solar power management analysis is only available in Revit. For presentation purposes, realistic view styles, orthographic and perspective views, walk-throughs and panoramic virtual tours, photorealistic rendering (A360 Rendering) with a surplus of photorealistic rendering materials are already in place included in both the LT and premium version. But for the premium alone, rendering within the product is an option. So is ray-tracing (also known as in-canvas rendering) with the addition of view-filters to clean out and present your render in any shape/size and stature that you deem fit. As far as documentation is concerned, 2D detailing, component tagging, line notes, revision tracking, dimensioning and annotations, phasing, scheduling and material take-offs are subservient to both the light version and the complete premium. Collaboration tools and features are only available in premium/ultimate version but not many people need this feature. DWG, DXF file format, Trusted DWG technology, regular images, IFC, DGN, SketchUp, DWF markup are all the kinds of files that both products will work with but Point Cloud and Decal file formats can only be used with the ultimate/premium versions just like the Revit API for third party application integration, extension and accessibility.